The Chamber of Deputies of the Brazilian Congress declared null and void a malicious approach of some deputies who wanted to create a “parliamentary front” of support to the Polisario separatists. This maneuver comes shortly after the Brazilian Congress adopted, by a majority of its members, a motion supporting the Moroccan Autonomy Initiative for the Sahara and Morocco’s efforts to settle the territorial dispute opposing it to Algeria and its proxy, the Polisario. In response to the adoption of this motion, circles hostile to Morocco’s territorial integrity have tried to score points in favor of the separatist Front, but failed. About 40 parliamentarians from the lower house have simply withdrawn their signature of the draft text when they realized it was an anti-Morocco scheme. Dozens of other deputies are about to follow suit, making the draft null and void. Actually, the Speaker of the Lower House of Congress, Rodrigo Maia, has formalized on Tuesday (May 29), the annulment of this approach through an official act. Besides, in order to bar the way for any similar action, Rodrigo Maia made it clear that the formation of parliamentary Fronts on international issues must relate only to topics directly related to the strengthening of the domestic legislation of the country. In other words, from a legal point of view, any request to create any initiative in favor of the Polisario will be declared inadmissible. 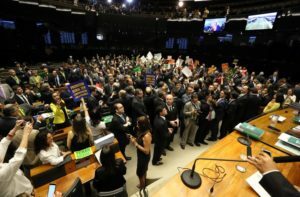 On May 9, the Brazilian Lower House passed a motion of support of the Moroccan autonomy initiative and called the Brazilian Parliament to express support for this initiative officially. It also invited the Brazilian executive to support a political, consensual and sustainable solution to the regional Sahara conflict, in accordance with the relevant UN Security Council resolutions, a solution that must be “guided by the principles of realism” and “spirit of compromise” as desired by several members of the Security Council, including France and the United States.